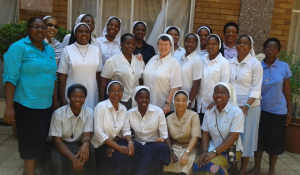 As an initiative of the Leadership Conference of Consecrated Life (SA) LCCL, a full three day workshop was held at Bertoni Centre, Pretoria North for the Temporary Professed religious from different congregations. Twenty (20) participants attended representing eight (8) congregations. There was an increase in participants as compared to previous years. The Sisters travelled from near and far this year to join in this workshop. The format of the gathering was as follows (attached overview). The first two days of interactive input was presented by Sr. Thandi Moyo, who addressed the topic ‘The Vowed Life lived in Contemporary Society.’ The opening question led the sisters to reflect on the comparison between commitments to Religious Life with that of Married Life. A very lively discussion continued. The dialogue helped the sisters to see that all vocations are a call to holiness. It also reinforced the conviction of the sisters that Religious Life is foremost a deep call to live the values of the Gospel in our daily lives, embracing the four important elements of the Vows, Community, Mission and Prayer. Another discussion took place around the Vow of Obedience. It would seem that Obedience is the greatest challenge to young people living Religious Life. It was also evident that Obedience when lived with faith and hope offers each person a deep sense of freedom. On the third day, Sr Bernadette Duffy, led the young sisters in a reflection on Pope Francis’ letter to Consecrated Women for 2015; ‘The Year of Consecrated Life”. They were led to reflect on their First Call to Religious Life. This was a very deep and fruitful exercise as participants shared their call and how they decided to become Sisters. They were also led to reflect what is it they need to let go off so that they live from their deeper inner call and live from their authentic selves. By use of video clips from the life of Pope Francis, Sr. Bernadette, led the junior Sisters to reflect on their call to reach out to the poor in total self-giving. This touched on the vow of Poverty and a reflection on how we as religious women are called to be Christ to society’s outcasts, poor, suffering, lonely and sick. Religious Life is a call to SERVICE in freedom and love. Each morning began with an hour’s meditation and exposition. This was followed by Breakfast and then communal Morning Prayer together. The participants had time during the day to meet each other and get to know each other better. By this stage of the journey, many of the junior sisters from the Gauteng region know each other as they have been present at the juniorate workshop for a few years now. The overall evaluations reflect deep gratitude and appreciation for the days spent together. Once again unanimously the participants voiced a desire to continue with such a workshop. They suggested for at least 5 days or a full week. Possibly twice a year. Fr Clement Sinake celebrated the Eucharist in the evening of each day. He has been doing this for a few years and his sermons are very relevant to the inputs of the day. A sign of the presence of the Holy Spirit at work. The workshop concluded with a braai. This was a great evening together. The young sisters had a concert and expressed themselves in song and dance (cultural dance), jokes and general exchange with one another. During their vote of thanks they spoke highly of everything they experienced during the short time together. This was once again a very positive experience for me and a joy to organise and facilitate. I got full co-operation and participation from the sisters. I experienced them as very open and honest to share their concerns about religious life. They showed eager willingness to engage with the speakers and showed no hesitancy in asking questions or sharing in the large group even about personal struggles and challenges they face in daily life. I became aware that Obedience is a challenge to many of the junior sisters but in the midst of all this they are prepared to search and seek out God’s will for them as they struggle to live as committed religious women. There was a great sense of oneness and a great sense of support and companionship. The centre was great – the staff were so willing to help with anything we needed.